The next generation YotaPhone has full-touch control on its always-on electronic paper display (EPD) and many other new hardware and software features, making it even more intuitive and interactive. 1-Look, 1-Touch Always-On Display With the first generation YotaPhone, notifications and other important information appear automatically on YotaPhone’s always-on display. The next generation YotaPhone allows users to open and respond to these notifications, with just one touch, without having to wake up and activate the color display. Users can immediately respond to mails and SMSs, accept and decline meeting invites and post to social media. The next generation YotaPhone delivers an even better reading experience on a bigger and better screen. The always-on EPD display is 4.7” with higher resolution, greater pixel density and a builtin light. With two displays, users can choose how best to use their smartphone. They can watch videos, play games, view photos and browse the internet on a bigger, brighter and more brilliant 5.0” AMOLED display. On the energy-saving 4.7” EPD, they can open and respond to real-time notifications, read books and newspapers, keep track of meetings and post comments to social media. 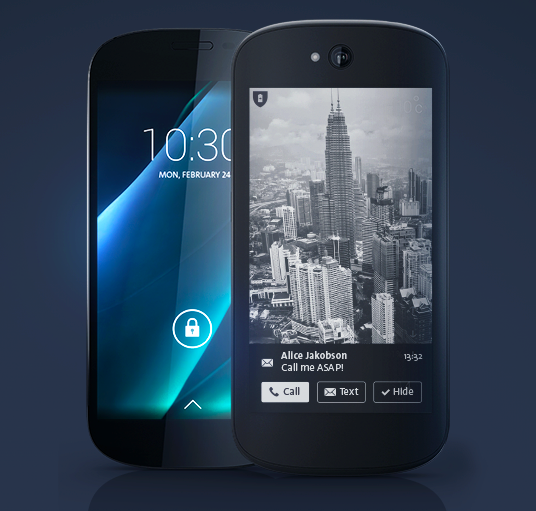 74% of YotaPhone is usable, interactive display, compared to just 30-40% on other premium Android smartphones. The next generation YotaPhone also comes with a Smart Power Mode so users can turn off the energy-consuming color screen and perform functions like making and answering phone calls on the always-on display to preserve battery life. The next generation YotaPhone also boasts a Qualcomm quad-core 800 series processor, wireless charging, near-field communications (NFC), advanced anti-theft protection and highperformance integrated hands-free audio (IHF). Yota Devices also announced today that it is opening YotaPhone’s SDK to third-party developers. Tools and information can be found at http://developer.yotaphone.com. Yota Devices also unveiled several new apps at MWC, including Sportscaster, which allows users to track their favorite team, including play-by-play text commentary streamed in real time to the always-on display. Fitness Tracker syncs with any health monitoring device and tracks health status and fitness goals. Yota Devices also announced a partnership agreement with Israel-based Cellrox to include the company’s multi-persona technology on YotaPhone to provide functionality, privacy and security for both corporate and personal use. An agreement was also reached with MobiSystems to allow for reading of office docs on YotaPhone’s always-on display.